يحظى فندق نوفوتيل كرايست تشرش كاثيدرال سكوير بمكان متميز في محور كرايستشرش سياحة, ثقافة, تسوق في منطقة كريستشارش سنترال سيتى الفاتنة. يقع الفندق على بعد 0 km من مركز المدينة، ويؤمن الوصول إلى أهم مراكز المدينة. إن سهولة الوصول من الفندق إلى المعالم السياحية الشهيرة الكثيرة في المدينة كمثل ‪Christchurch Cathedral‬, The Hazed Collective, ‪Tree Houses for Swamp Dwellers - SCAPE Public Art‬ هو استثنائي بحد ذاته. إن نوفوتيل كرايست تشرش كاثيدرال سكوير حريص على توفير الراحة للنزلاء، فلا يوفر الموظفون جهداً في تقديم أفضل الخدمات وضمان حسن الاستقبال. يقدم الفندق خدمة الغرف على مدار الساعة, أمن على مدار 24 ساعة, خدمة التنظيف يوميًا, متجر هدايا/تذكارات, خدمة سيارات الأجرة لضمان الراحة القصوى لضيوفه. استمتع بوسائل الراحة الراقية في الغرف أثناء إقامتك هنا. بعض الغرف تتضمن تلفزيون بشاشة مسطحة, اتصال لاسلكي بالإنترنت, غرف لغير المدخنين, مكيف هواء, تدفئة لمساعدتك على استعادة طاقتك بعد يوم طويل. صممت خدمات الاستجمام في الفندق والتي تتضمن مركز للياقة البدنية, مسار جولف - ضمن 3 كم لمساعدتك على الاسترخاء والراحة. إن نوفوتيل كرايست تشرش كاثيدرال سكوير هو مكان مثالي للمسافرين الذين يتطلعون إلى الراحة والاستجمام في كرايستشرش. Right in the middle of downtown Christchurch. Walking distance to food, shopping, city sightseeing and car rentals. Room is comfortable although the toilet basin is very small. Bed and pillows very comfortable. Breakfast is average for a 4-star hotel. But it should have some variety because I stayed here twice with a 12-day break in between and the breakfast food is exactly the same. I would like to commend front desk manager Herbert. He was very helpful when we checked in at 11.00pm. Upon learning that we would return to stay again 12 days later, he took the initiative to pre-check in for us for our second stay. We love the breakfast, the service, the location, but this hotel doesn't provide the heater. The floor feel cold and i don't find a sandal hotel there.. Except that, everything was perfect. The staff also give the room as we request.. thankyou..
Great hotel to stay in CHristchurch...very clean, very near city attractions. Staff are friendly and helpful. Made to feel very welcome from the 1st minute you arrive. The staffs are amazingly helpful, full of smiles and always there to help. Hotel is clean, tidy and well equipped. Location is ideal and the view is outstanding. Would highly recommend a stay at NOVOTEL Christchurch Cathedral Square. It was very comfortable staying. Good location just next to church. warm and comfortable bed. Just be careful with TV, we didn't watch the movie but when we check out they still charge us the money. But staff was very helpful to help us wavier the cost. Unfortunately this type of hotel charge for everything: internet and tv are a commodity today and should be a norm for a room. To charge for internet (outreagous prices by the way) is a deterrent to staying again. On-site facilities. Helpful and attentive staff. Location. 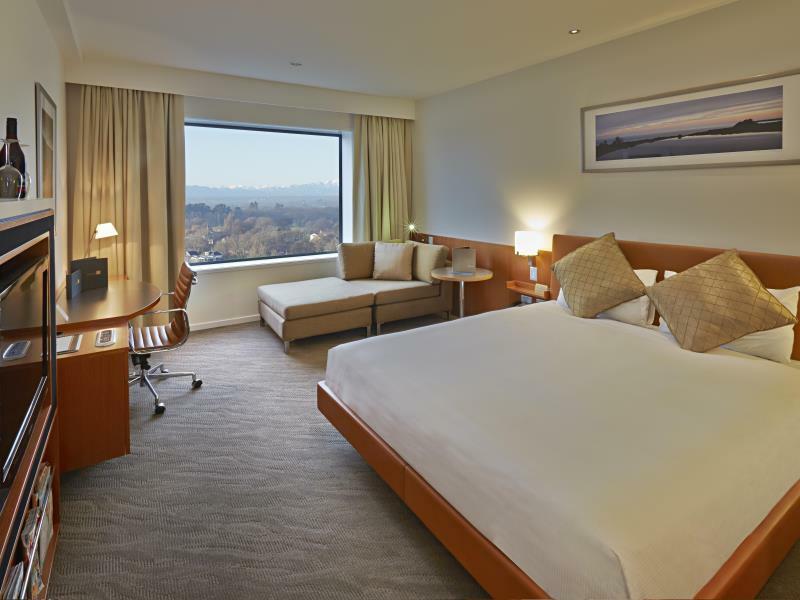 We enjoyed our stay at Novotel Christchurch. Located opposite the Cathedral (unfortunately this was severely damaged in the earthquake a few years ago). 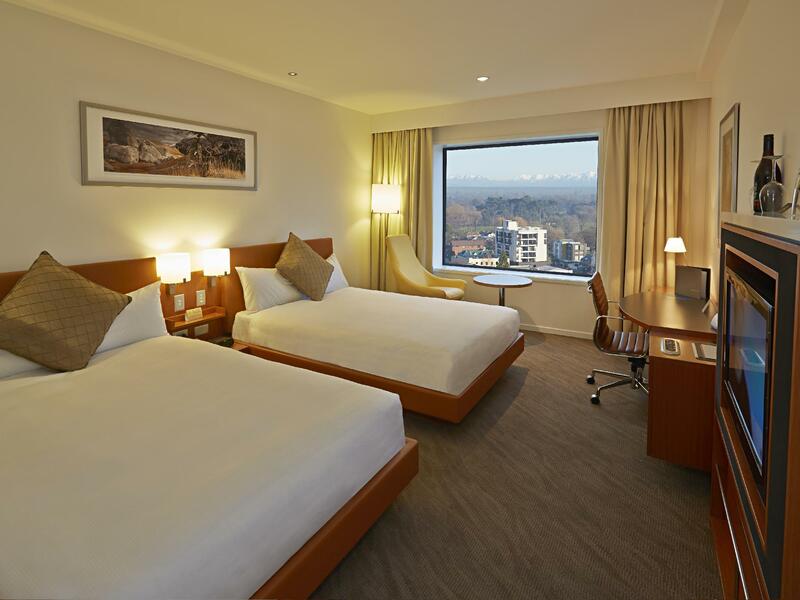 Christchurch is a city that is on it's way to recovery and the Novotel is ideally located to see all it has to offer. The hotel is locatied just next to the Cathedral! No other hotels is as near! The rooms are standard although not very spacious. There is a 20 min complimentary internet, and there are a few computer stations at the lobby providing free internet too. The 20 min limit is not enforced and you can actually use the computers until someone waits in the queue. Concierge service is extremely attentive. No free parking but the loading area is very wide and can park for a few min. Very nice spread of breakfast provided considering the cheap price and how expensive NZ is! we love to stay here.. the breakfast, the staff, the location.. all good!! Only had one person at the front desk for Chinese New Years. When eventually helped was not friendly. Called down to front desk and had to wait awhile for someone to pick up. Wouldn’t accomdate for even an additional hour late check out and internet cut off early after paying high price. Overall disappointed. 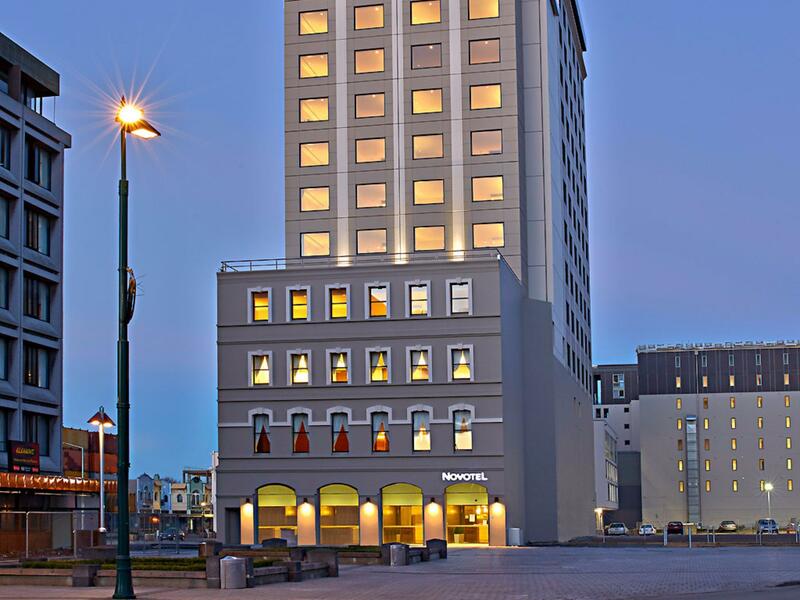 Hotel is in a great location if you wish to be in the city center. Novotel staff were amazing. We had issues with the lights in our bathroom and I found the mattress uncomfortable for my back. The staff went out of their way to fix the problem. We were upgraded which was really appreciated. The rooms were nice and clean and the second bed was very comfortable. We would definitely stay there again. Thanks Novotel. If you have any back issues or don't like a hard bed, this probably isn't the place for you. The beds were super hard! The restaurant was a bit pricey but everywhere in nz is. But it was super tasty at least! The staff was very pleasant and it was new and clean. Bc of the earthquake, that part of town is devastated. Don't look for much nightlife you need to cab it. Only one other restaurant there is Francesca's and reservation is a must! Loved our stay here. Great place for us to relax for our last night in NZ after a very busy holiday. Staff were super friendly and helpful. Bed was so clean and comfortable. Loved the shower. Would have liked free wifi, it felt a bit stingy that we had to pay for it considering how much we paid for the room compared to other cheaper places we had stayed at and gotten complimentary wifi. However we would definitely stay there again! The staff is very kind and informative, the hotel doesn't have free parking but it does have an overnight paid public parking next door (NZ$7 per night from 5pm to 10am). The room is spacious with a comfy sofa next to the window. The room is equipped with all the necessary amenities but no separate bathtub and shower. Breakfast has wide variety of international breakfast and some NZ's own speciality. The location isn't bad, next to the cathedral and some cafes down the road. Overall a very pleasant stay. My husband and I recently stayed one night at the Novotel Christchurch Cathedral Square and were very impressed with the location. The staff were very friendly and efficient and we would definitely stay again. The attentiveness and courtesy of the staff. The efficiency of the houskeepers. The willingness to go the extra to please. On the whole, our stay of 7 days was without incident and very pleasant. Unfortunately the city, having experienced severe earth quakes, is rebuilding. In this regard, the hotel was exceptionally quiet, considering all the work in the vicinity. The only downside for us, was the weird design of the bathroom, with the only sink being located outside the bathroom itself and serving as both a vanity and sink. The hinged mirror over the sink was also difficult to use and lacked light. When using the bathroom, there was nowhere but the floor to place toiletries. A small shelf or vanity unit would have been useful. Also, there was no mirror in the bathroom. We understand that most, if not all of the rooms have a similar layout. We wanted to see Christchurch and this hotel was one of the very few international hotels, in the city center, which was open and fully functioning after the earthquake. Its location is the most remarkable attribute, followed by the very helpful and pleasant Staff. The hotel has a great location right in the center of Christchurch. Only 20 min from the airport. Hotel room was a good size ad clean. Good shower with lots of hot water. Staff was very friendly and recommended several places for us to see during our 1 day visit to the city. Woud definitely stay at this hotel again. Only disappointment was paying $17 for 10 minutes wifi - were told it was free in the foyer but I logged on wrongly apparently and was charged for it when we checked out ... no explanation of how to log on was given with the 'It's free in the foyer' advice from reception.